Hey, I like your deck. I'm also playing casual Teysa, Lady of Death (Budget). Open the Armory : it can also get Animate Dead which is another card to consider adding or Deathmantle. Sun Titan has a lot of utility with creatures/other cards that you want to play with Teysa. Not only can he reanimate Skullclamp, but also Spiritkeeper or other creatures who make tokens when they die which are great with Skullclamp. I think Titan can overall do more than Yosei. Doomed Traveler is an upgrade for Martyr of Dusk. It's one mana and it makes a flying token when it dies. Reliquary Tower is one of the best lands to have with Skullclamp. Necropotence is powerful draw in black also very good with Tower. If playing Karmic/Lark combos then Carrion Feeder and Mirror Entity are other powerful creatures no mana cost sac outlets. 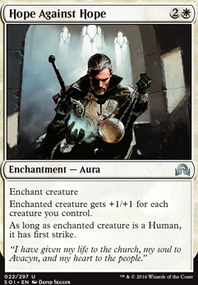 Entity is also good to pump all tokens as well as Teysa attacking for Commander damage. Buried Alive is great to setup Lark/Karmic/Seer/Cutthroat combo. 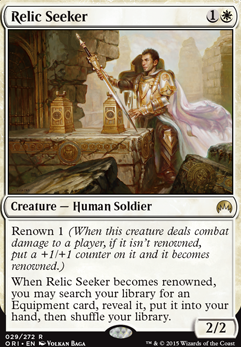 Relic Seeker : Unless you can reliably get damage through with it I'm not sure how often you will tutor with it. Assemble the Legion : While a super fun card, I'm not sure how well it synergizes. While yes, it can be a win-con because of the tokens, it seems too slow to be able to kill a whole table with it. I'd warrant running tutors just to find lightning greaves so it is a consistant game plan. Steelshaper's Gift, Open the Armory, and Relic Seeker are good budget options and Enlightened Tutor and Stoneforge Mystic the non budget. Lots of good advice and options above, but I'll chime in anyway! Settle the Wreckage: havn't had much succes with this personally, but it's an option. Argivian Find: good to get some recursion, especially if sunforger get's blown up. 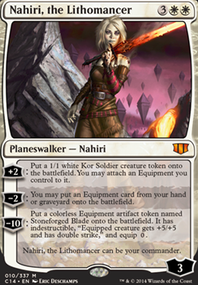 Dispatch: basically a better swords to plowshares in an artifact deck. 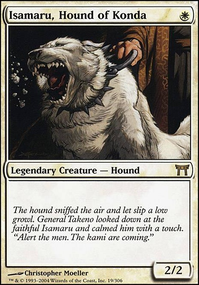 Intimidation Bolt: good for stopping attacks that you don't want to happen(think Narset, Jeleva, Etali triggers). Price of Progress: Most damage for 2 mana you'll get. In the late game it becomes fantastic. Sulfurous Blast: another wipe option. Auriok Steelshaper: smaller equip cost. Masterwork of Ingenuity: EVEN MORE SUNFORGER! Sigarda's Aid: flash it in, free equip. 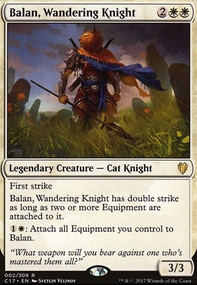 And of course you might want your Sram, Senior Edificer and Puresteel Paladin and Danitha Capashen, Paragon. All that fun stuff. Here are a few cards you could consider for your Sunforger Package Crackling Doom, Kolaghan's Command, Hide / Seek, Wear / Tear, and Utter End. Steelshaper's Gift and Relic Seeker are both really cost effective ways to get the equipment you're looking for. You could also run Masterwork of Ingenuity to double up on a good equipment. Brass Squire is a cheap way to get past equipment costs. 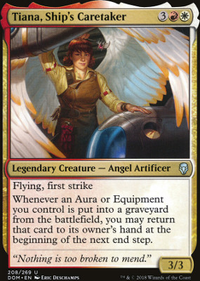 Akiri, Line-Slinger, Kari Zev, Skyship Raider, and Swiftblade Vindicator are cheap minions that hold weapons very well. I agree with what sagramore is saying, pick a theme with how you want to construct your deck and go from there. From the comments and the way you want to go, which is going wide than stick to anthem like effects and equipments that will help you build your army and ramp. Since you said you are on a tight budget I'll list some cards that are less than $5 that might be able to help you out. Rampant Growth, Cultivate, Farseek, Faith's Reward, Wrath of God, Hunter's Insight, Relic Seeker, Auriok Steelshaper, Steelshaper Apprentice, Angel of Jubilation, Remember the Fallen, Cathars' Crusade, Behemoth Sledge, Qasali Pridemage, Leonin Warleader, Prowling Serpopard, Reclamation Sage, and Krosan Grip. Hope some of the cards listed would be able to help you out!